Roger Pielke Jr.'s Blog: Is Manufacturing Special? 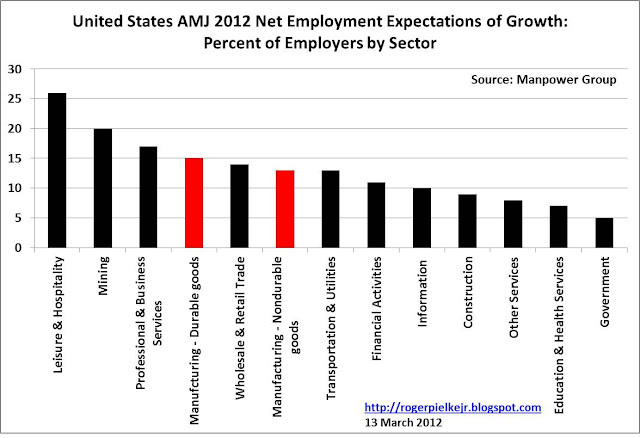 ManpowerGroup has just released their latest employment outlook survey looking to the next quarter (April-May-June). In the graph above I show the report's numbers for companies in the US expecting to hire more employees over the next three months (calculated as the percent expecting to add minus the percent expecting to cut, US data here in PDF). I have highlighted the manufacturing sectors in red (durable and nondurable goods). They show significant expectations for hiring, but less than leisure & hospitality, mining and professional & business services. With professional & business services currently employing about 18 million people, as compared to about 12 million in manufacturing, someone will have to remind me why manufacturing is supposed to be a special sector and not not professional and business services.